Get a personalized cartoon drawing of your children, drawn in colored pencils style as any Random Superhero Characters of your choice. Ready-made drawing can of children can be printed on mug, used as avatar picture or printed on canvas for a memorable gift to relatives. Photolamus can design your own superhero character and turn it into a cartoon drawing of your child. Send us photos and mention any requirements below and we will create a superhero caricature featuring your child, spouse or any other person upon your wish. 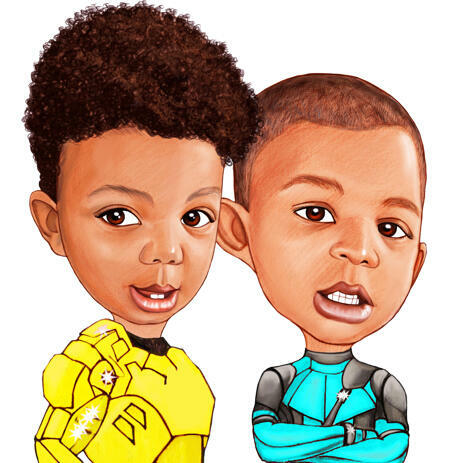 Drawing of Children Cartoon Caricature will be delivered as a printable JPEG File on Email. Your ready-made cartoon drawing is available for shipping in other delivery options like Canvas Print, Photo Print, Mugs, Puzzles, Pillows and any other. All products can be shipped worldwide.